Here’s the thing, I lived in Dublin all of my life until I was eighteen when I left for the big smoke. Although I now live in London, I visit home on a regular basis, It’s been so interesting seeing my city through the eyes of a parent. There are a tonne of things to do in Dublin with kids! 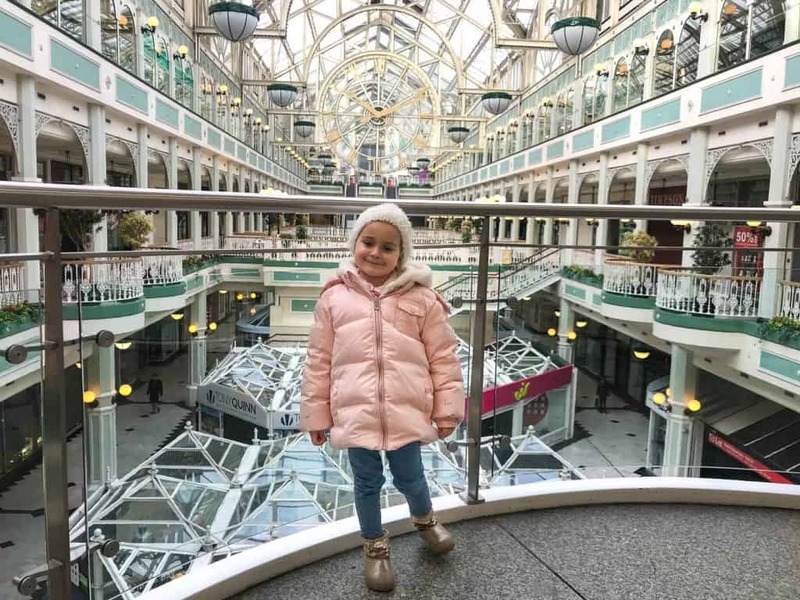 My little ones love visiting their grandparents in Dublin and enjoy our days out seeing the city and beyond. Something I love most about home is we can be in the city, or the mountains, within a short period of time. Most people visiting Dublin stay in the city centre, however it is the mountains where I love the most. 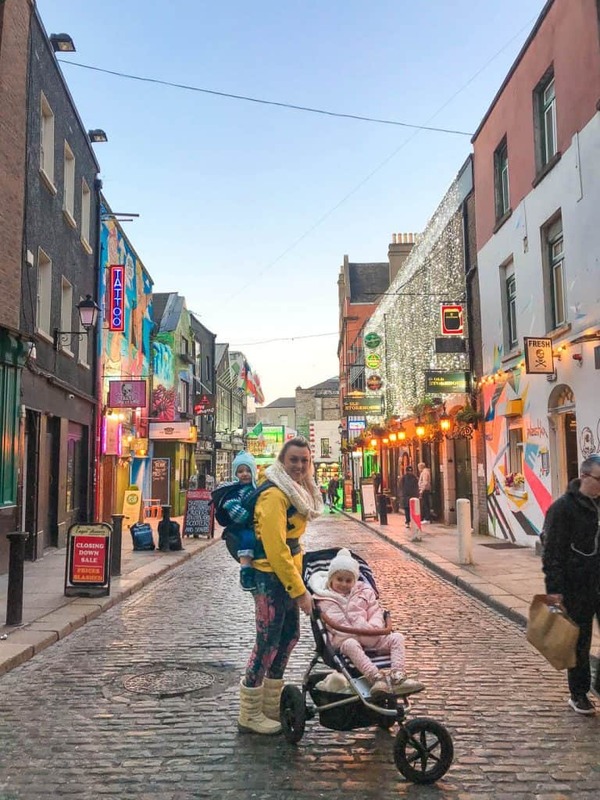 Dublin City itself is easy to walk around, it’s not at all strenuous and for younger ones a stroller would works best. If you are planning on doing a lot of touring you can save money by getting the Dublin Pass. I always rent a car when visiting Dublin so I can get to the mountains and other attractions outside the city centre easily. No matter where you go in Ireland you will be fully immersed in the culture, it’s hard to escape it since everyone is so friendly. That is one thing I’ve learned most about my country when I go back as a tourist. We are literally the most friendly bunch of people you will ever come across, no matter what part of Ireland you visit. 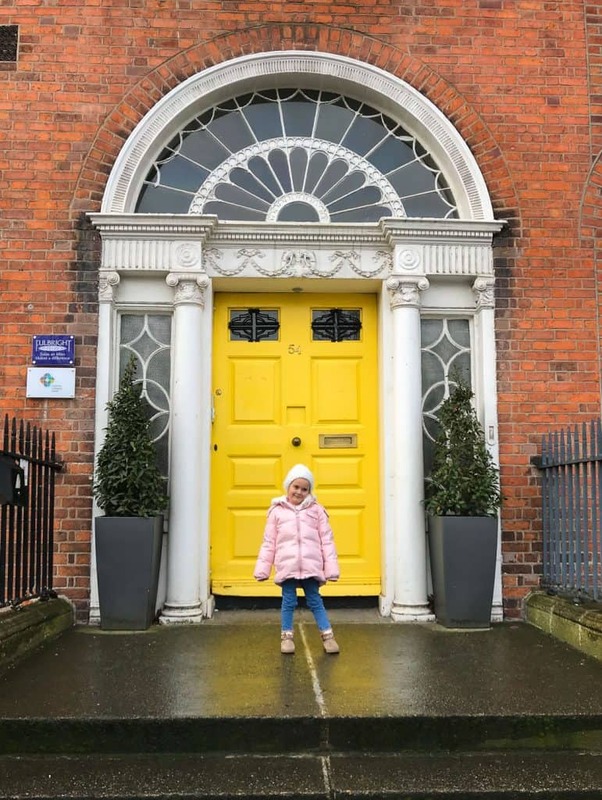 We’ve spent many a weekend both in and out of the city, here is our list of the best things to do in Dublin with kids. I also cover accommodation recommendations! The viking splash is a really fun and interactive trip through the streets and waterways of Dublin. The ancient bus come boat is staffed with very energetic and uplifting tour guides that deliver a historical tour in a fun way for kids and adults. All passengers are given a viking helmet and later instructed to use to their full advantage (I won’t ruin the surprise). I find these kind of tours amazing for seeing a tonne of sites whilst also keeping little ones entertained. They were amazed when the bus drove into the water! Keeping with the theme of vikings, Dublina is a fun and interactive museum about medieval times. Visiting is an amazing historical lesson for little ones if they like that kind of thing. I would say 5+ is a good age to take kids to this museum. They have some great resources on their website. Including downloadable activity sheets and learning materials to keep them entertained throughout the visit. The Ark is a fascinating cultural centre especially built for kids and based in the centre of Dublin. There is a tonne of different events on throughout the year and it’s worth checking the website to see if it’s something you’d be interested in before rocking up. From interactive installations, to music shows and mini-museums, the centre is quite a diverse space. Checkout the upcoming events here! The Irish Immigration Museum is a relatively new space and appeals to older children. 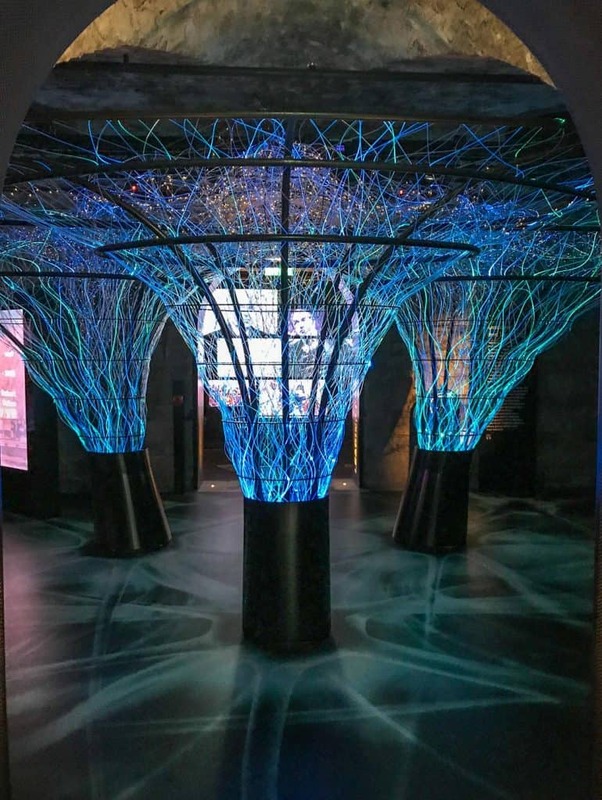 It’s one of the most high-tech interactive museums in Ireland and for that reason maybe a little above young kids. That said, my 4yo did love elements of it. We were given passport to stamp at all of the different stations. Each area had touch screens and educational information about how Ireland has evolved. My kids really loved the area where we learned about River Dance and the place where they could make digital postcards! One of my all time favourite memories as a child was visiting the Gaiety Theatre with my grandmother. She use to take us once a year and I absolutely loved it. Things haven’t changed too much at The Gaiety but it remains a prominent influence on Irish arts and theatre. They regularly have family-friendly shows and performances on throughout the year but it’s important to time your visit if this is something you really want to do! Some of the upcoming shows include Madagascar, Aladdin and an all time Irish favourite, Riverdance! St Stephen’s Green is a beautiful park right in the centre of Dublin. It’s a photographers haven with little stone bridges crossing a lake, manicured flower beds and walkways through stunning greenery. The park is a lovely escape from the city and an ideal place for a picnic lunch or some time in the playground. 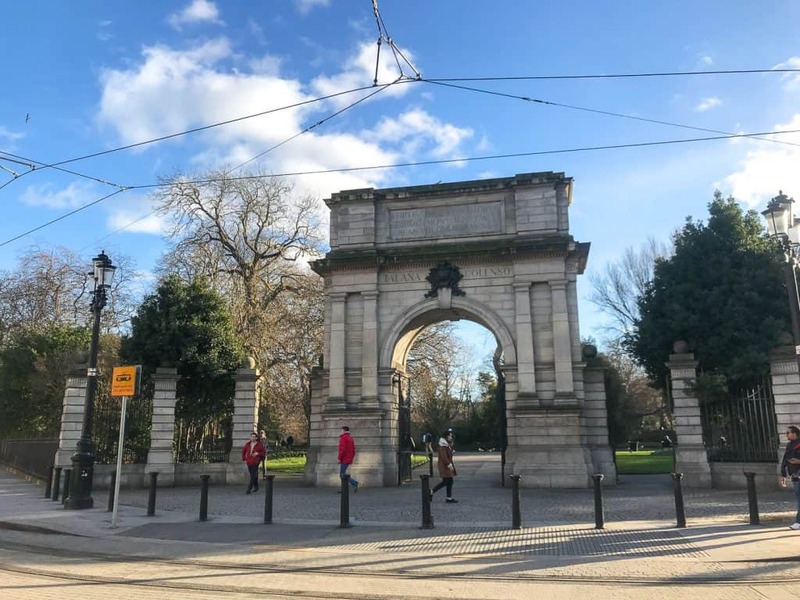 The playground has lots of features for younger and older children, with climbing frames, slides, swings, it’s a nice place to start a day in Dublin City. The park and surrounding Georgian houses are featured in a number of movies and is one of the most filmed locations in Ireland. One of my favourite places is the nearby St. Stephens Green Shopping Centre. It has sunning glass and iron interior, a giant clock in the centre, and beautiful staircases that compliment the architectural wonder. It’s well worth wandering in for a coffee or just a photo! Grafton Street is the heart of Dublin and one of the main areas in the city. It’s filled with boutique and designer stores, beautiful flower stalls, as well as souvenir shops and cafes. My absolute favourite thing to do when I go to Dublin City is walk the length of Grafton Street and listen to the many talented, often young buskers. I am always blown away by the level of entertainment you can simply get on the streets of Dublin. One of the best places to have a coffee in Dublin has to be in Bewleys Cafe. It’s recently undergone a multi million euro makeover and restored to perfection. Checkered tiled floors, stunning fireplaces with burning logs and preserved stained glass windows, it feels like stepping back into the 1920’s. Although this is a super fancy cafe, they are welcoming of little kids. The staff were so lovely to my two on our last visit. I highly recommend the hot chocolate, the kids will love the mini version, its extra special, I won’t spoil the surprise! 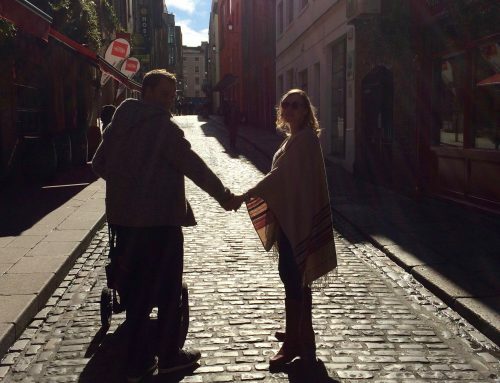 The one place every person that has visited Dublin will have been to is Temple Bar. It is the tourist epicentre of the city! Cobbled streets, colourful buildings painted in bright colours, buskers filling the streets with Irish music, the area is best known for the pubs and nightlife. That said, it’s a really lovely place to walk through during the day as well, and the kids generally love the live music on the streets. The buildings around Merrion Square are iconic to Dublin with their beautiful coloured Georgian front doors. There is a sign posted walk around the area and it is really fascinating to see such preserved historical buildings with a splash of vibrant colour for good measure. 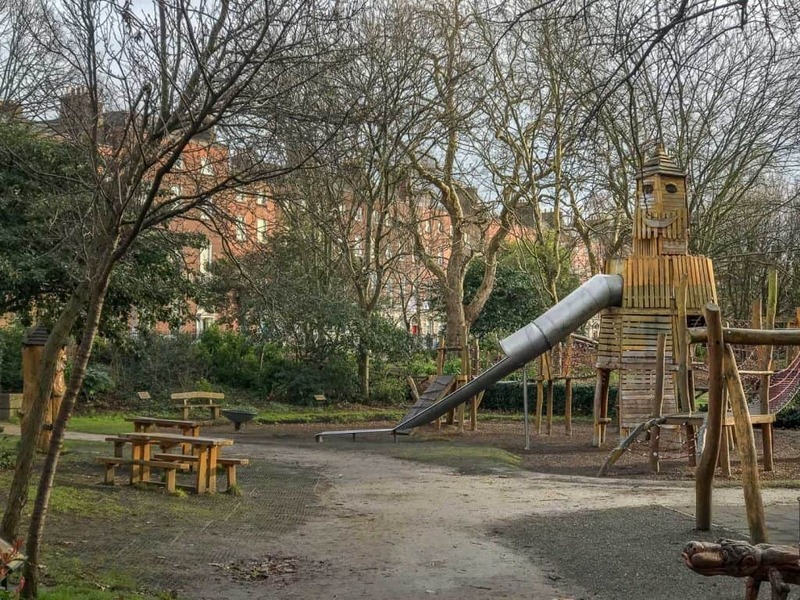 In the centre of Merrion Square there is a playground themed around Oscar Wilde’s short story, The Selfish Giant. It’s certainly one of the nicer playgrounds in the centre with fascinating sculptures and beautifully landscaped flower beds. Imaginosity is a big hit with local families and visitors alike. It’s essentially a children’s museum dedicated to all things fun, play, learning and discovery. We are big fans of museums dedicated to little ones and it is great to see them in so many cities nowadays. With more than three floors in a massive buildings, its a vast space for little ones to discover and a full day out. There is an area for baby and toddlers on the third floor and the museum is suitable for those up to around aged 9 according to their website. From a doctor surgery, to a bank, and a post office, to a garage, kids can get a really good insight into different professions through role play. At 8 euro pp, its a great price for a fun filled day out. Lets be honest, there are no tropical beaches in Dublin. They are often wild and windy but we have some very cute coastal towns. Many have charming street markets, traditional candy shops and some great restaurants. Dun Laoighre, Bray and Howth are some firm favourites among locals for a brisk weekend walk on the beach, followed by a yummy traditional lunch. 800 year old Malahide Castle is only a short distance from Dublin Airport and has some stunning grounds for families to explore. The medieval castle is surrounded by places of discovery, from the Butterly glasshouse to the fairy trail in the woods, it’s a fantastic day out for kids. The playground is an amazing space for kids of all ages and not to mention a tour of the castle itself. There is a tonne of things to see and do both inside the grounds of the castle and in nearby Malahide village. The Phoenix Park is probably the most famous of all within Ireland. Home to resident deer, it draws wildlife spotters and animal lovers alike. Its also home to the Irish president and some very quaint old buildings surrounded by stunning parkland. Phoenix Park is a huge space and of course has a playground for little ones as well as a cafe and many landmarks. I love taking the kids to see the deer grazing in the fields. Like I’ve mentioned previously the Dublin Mountains is my happy place, I always visit when I go home. Glendalough is a glacial valley with an ancient monastery. Stunning mountains surround a mirror lake and most of the area has a board walk allowing little visitors to get around the site easily. There are a few different hikes but the boardwalk is certainly the easiest and most doable with kids. Powerscourt is another hit with many locals. Featuring a stunning waterfall and lush green surroundings, many people visit with picnics in the summer. That said, its also lovely on cooler days for hiking. 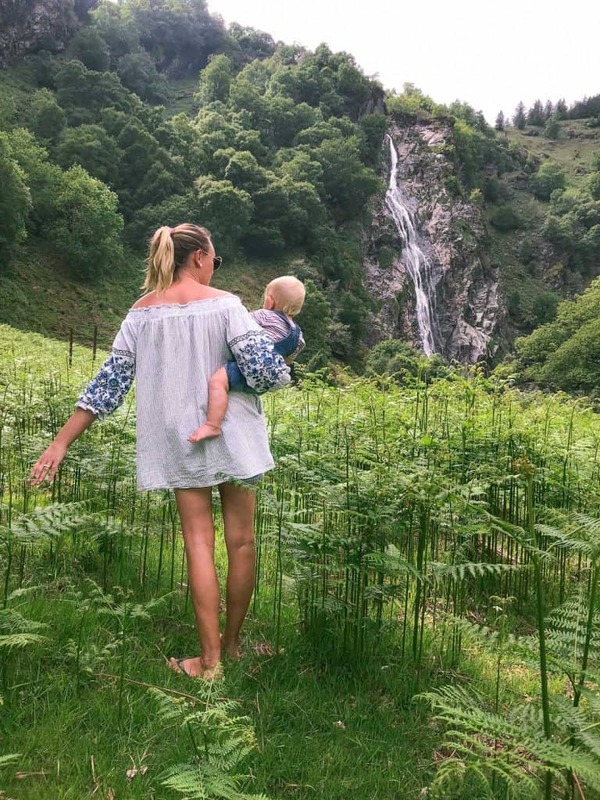 The waterfall area is part of the wider Powerscourt Estate and also has a cafe and a world famous ‘dolls palace’ appealing to many children. The garden grounds are really beautiful and probably a reason so many people get married at Powerscourt Estate. If you prefer arranged tours rather than having to DIY your trip, I highly recommend checking out all the amazing tours on getyourguide. They have a whole array of classic and unique tour options within the city and outside of it (and even airport pickup). 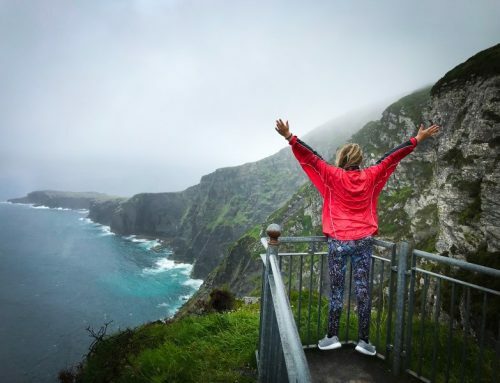 Headed to Northern Ireland as well? Check out this Belfast food tour! I have previously stayed at The Printhouse AirBnB in Dublin City Centre. It was in a great location and the host was super accommodating of families. He had a high chair, toys and a cot for us to use. Likewise there was a lift in the building making it easy to get in and out with a stroller and two kids. The apartment had two bedrooms, two bathrooms and an open plan lounge. It worked perfectly for us and it was a really good price in relation to it’s central location in my opinion. Here is £25 off your first AirBnB stay. Our go-to system for finding family friendly hotels is by using Booking.com. On booking you can filter by family friendly and even filter the reviews to only see the reviews left by families! Ready to book? Find the best deals on travel insurance, flights, reliable internet, and rental cars! This post contains affiliate links. It does not cost you anything extra to use them. We will get a small percentage for our travel piggy bank.